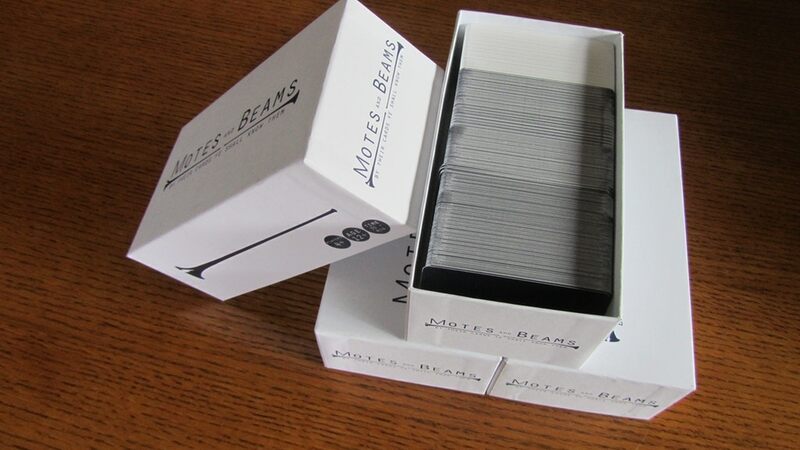 I've been trying to come up with some clever way of introducing this game, but I think that straight-forward is just the best: Motes and Beams is basically Mormon Cards Against Humanity. Though there's a bit more than that, as they throw in extra cards where you can swap or take cards from opponents, or have to perform a dare. It's a tongue-in-cheek look at the Mormon faith, made by Mormons who are looking to dispell the stereotype that all Mormons are boring. The game is up on Kickstarter now. Motes and Beams is the perfect combination of fun, Mormon culture, and Doctrine. Playing this game has lead to discussions about how Ryan Gosling was raised LDS, why there are always Cheerios in church couches, and Ammon's bag of arms. An in-depth knowledge of LDS Doctrine is not necessary to enjoy Motes and Beams. 1) To begin each player draws 10 Motes (white cards) The player who has most recently performed a good deed is called to be the Judge. 2) The Judge selects a Beam (blue card) to read aloud. 3) Players submit Motes face down to complete or answer the Beam. 4) The Judge picks the Mote(s) they like the most. Whomever submitted the winning Mote(s) is bestowed one Blessing. 5) Players replenish Motes and the person sitting to the right of the Judge is called upon to become the new Judge. 6) The game continues until someone has 10 Blessings and is deemed the winner. The Kickstarter campaign is up and running now. It's set to go for another 25 days.